I know it’s supposed to rain and snow this weekend but it’s practically Mid-April so we’re just going with it, ok? It’s time for springy food, cooler food, lighter food. This is that! Also featuring noodles. 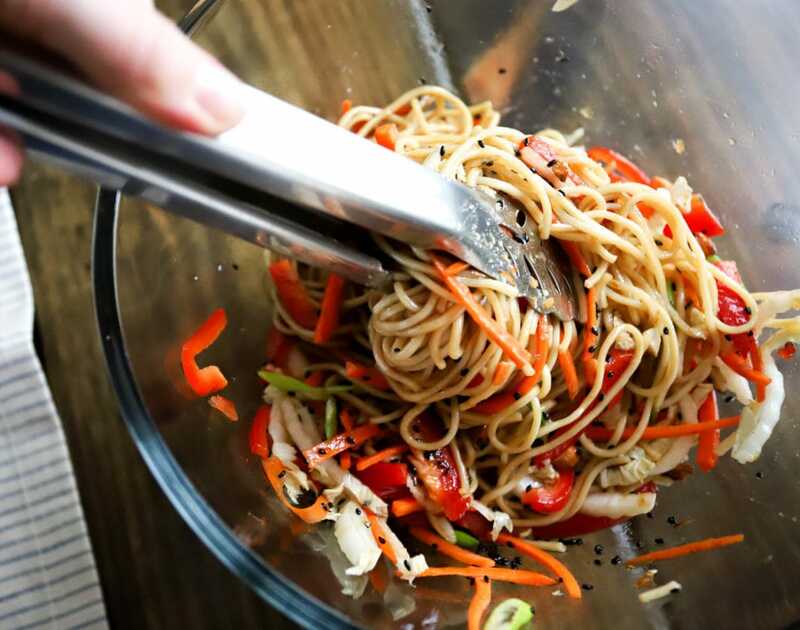 I wanted to make a lunch-type salad with a super savory soy-based dressing, tons of crunchy veggies, and noodles, full stop. 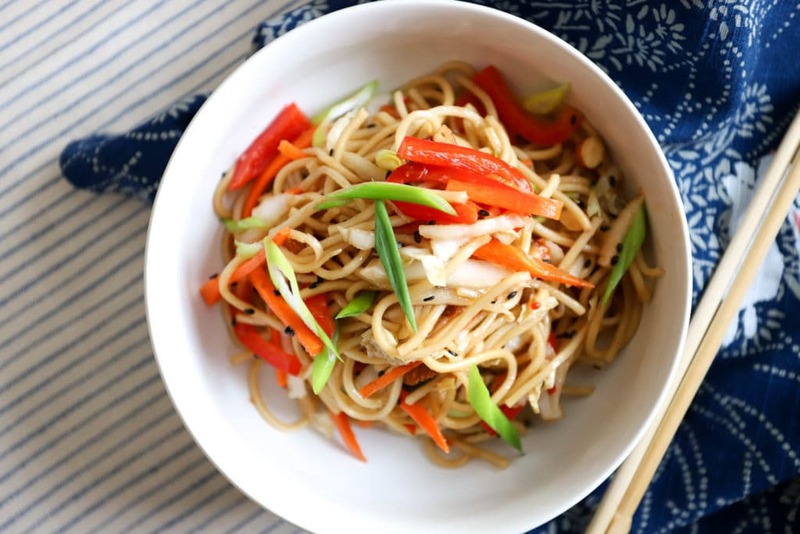 I went vegetarian on this version but you could definitely add some leftover cooked chicken, and the veggies you use can be mixed up every time you make this based on what you have in the fridge and based on what your preferences are. I MAINLY wanted to make this because I ordered a whole heap of these ramen noodles on Amazon that came highly recommended AND THEY WERE SO GOOD with exactly one exception: they do not store well at all with no exception. 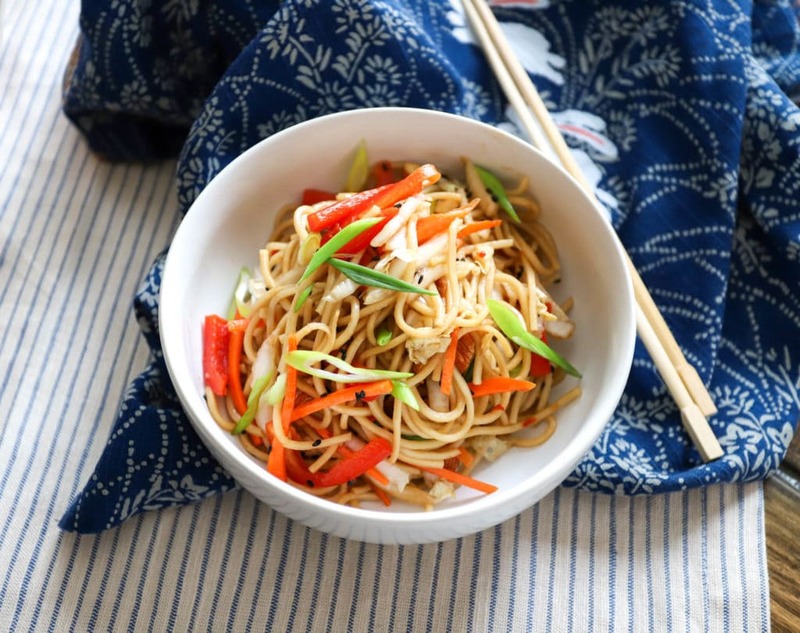 I made this mid-day and it was so good, the noodles were the perfect texture, and by evening when we had this for dinner they were mushy and kind of dissolved in our mouths as we ate, not cute at all. 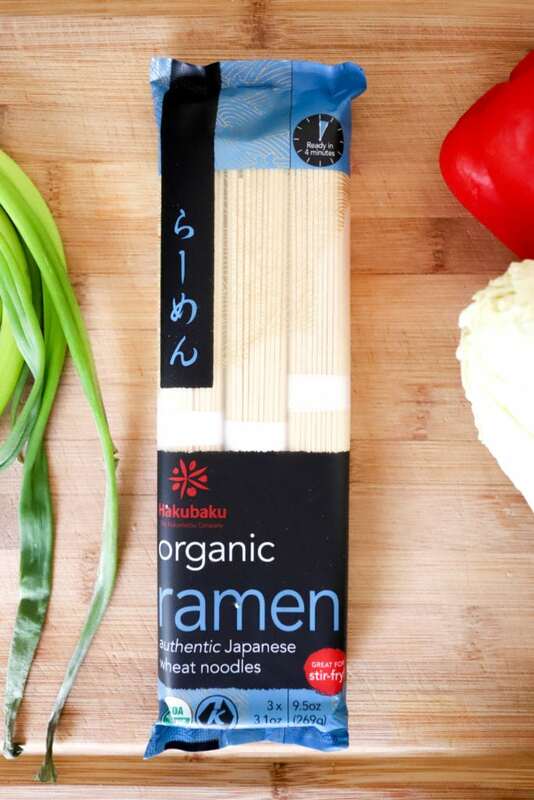 So, while I DO recommend these noodles because that’s just how certain noodles behave and the flavor was excellent, I’d say to make this right when you’d like to serve or use a noodle like spaghetti as a substitute which would be equally delicious. 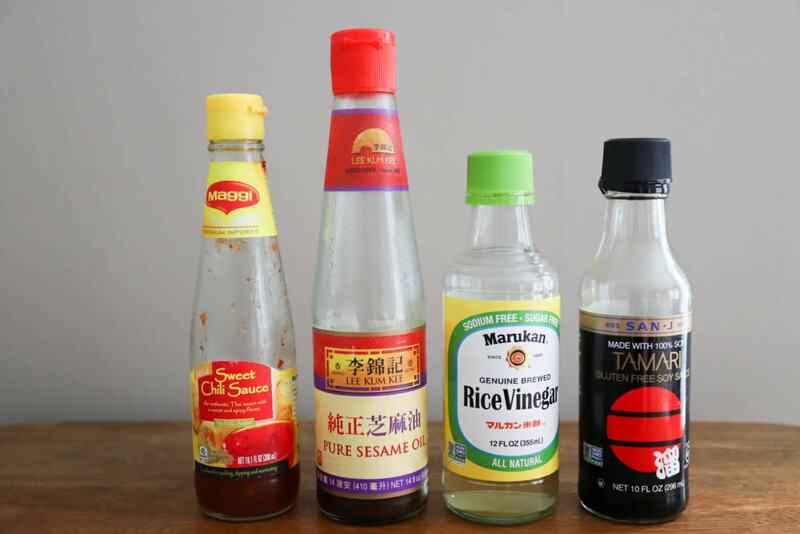 The dressing is the real star here, use any noodle you want, seriously. On to the dish! These are the noodles. Amazing flavor, sad leftover powers. Cook the noodles like the package says and rinse them under cool water to keep them from sticking to each other, then let them cool just a bit while you make the dressing and prepare the veggies. 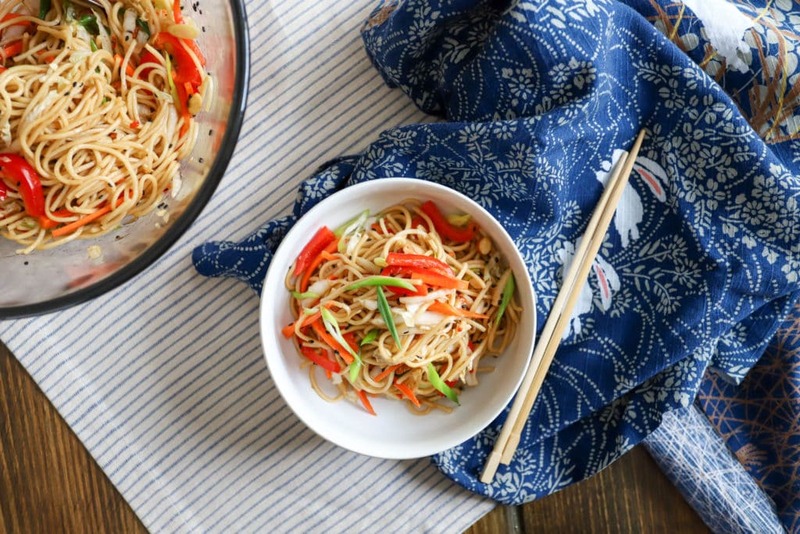 I used cabbage, green onion, carrot, red pepper, and toasted chopped almonds here – but cucumber, other herbs, avocado, and bean sprouts would also be great in this. The dressing is sweet chili sauce (use the hot version if you like spice), sesame oil, rice vinegar, and soy sauce. Whisk the ingredients together and taste the dressing; add more of any flavor you’d like to taste more of, or make a double batch for extra salad and marinade uses throughout the week! 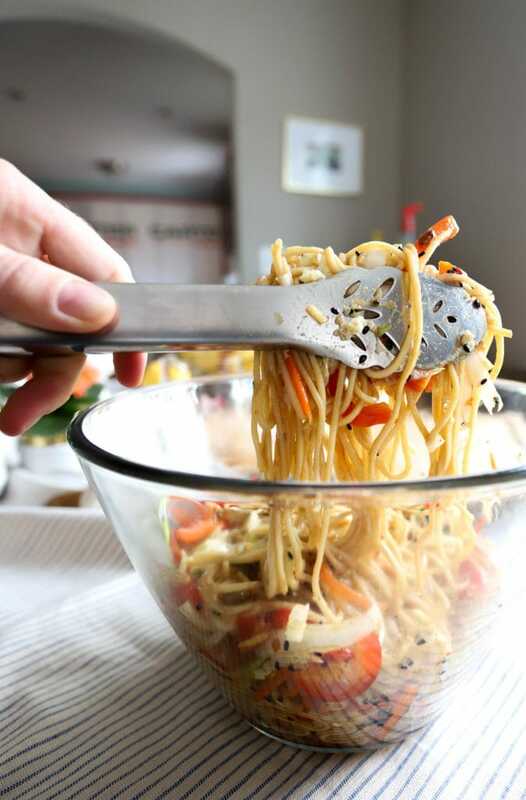 When the noodles are cooked and the veggies and dressing are ready, add everything to a large bowl. Drizzle about half the dressing over the salad and taste it; add as much more dressing as you’d like. That’s it! 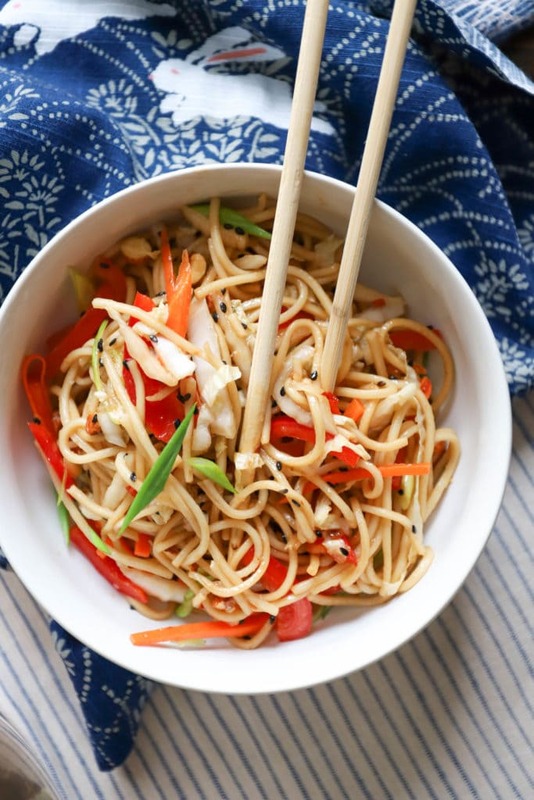 I add some more sesame seeds and green onions to the top of each serving, and I think some pickled ginger served on the side of this would be delicious. 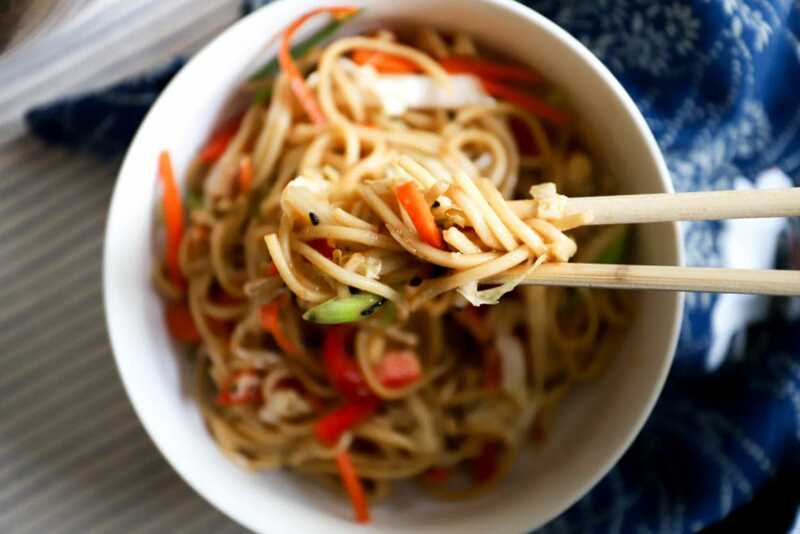 The thing about the noodles is, this is so delicious that you won’t WANT to eat this later. Gobble it up asap at room temperature, congratulate yourself on a quick + healthy lunch, and go play outside! Or dream about outside, in the event it’s snowing where you are. 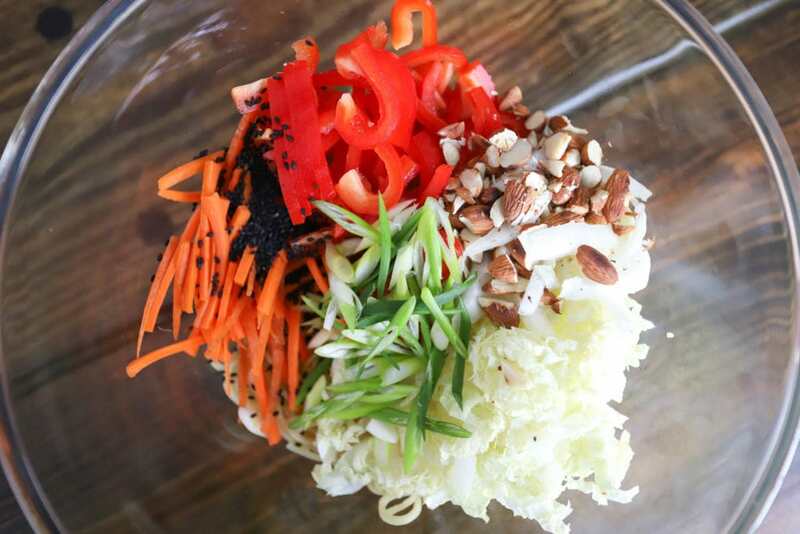 In a large bowl, add the cooked ramen, veggies, almonds, and sesame seeds. 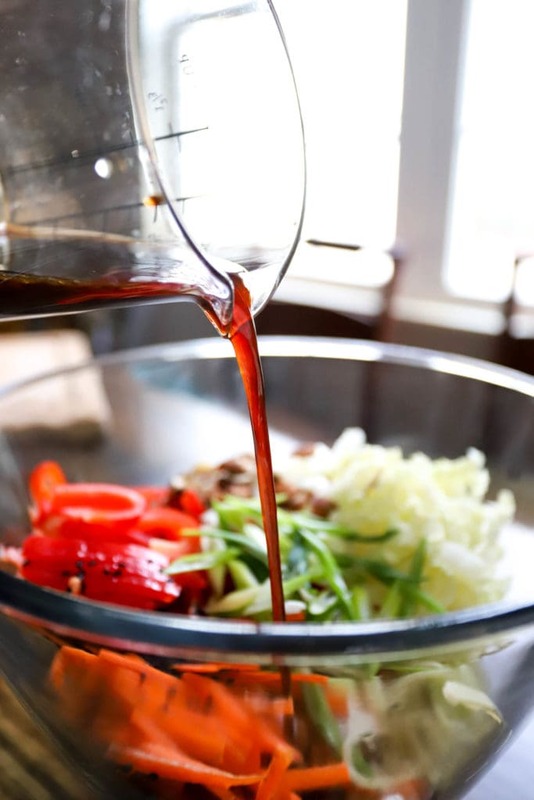 In a separate small bowl, whisk together the soy sauce, sesame oil, sweet chili sauce, and rice vinegar. Taste, and add more of any ingredient to your preference. Drizzle about half of the dressing over the bowl with the noodles. 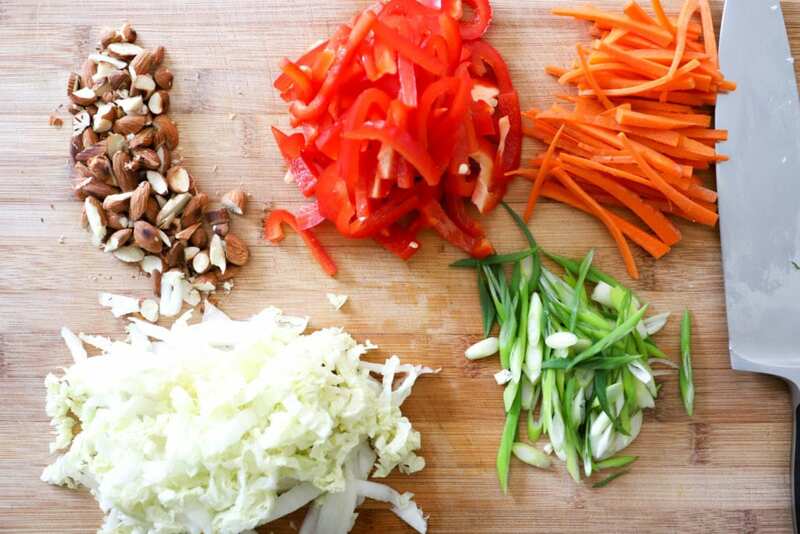 Toss the salad together with tongs to distribute the veggies and dressing. Taste, and add more dressing if you'd like. Some ramen noodles disintegrate quickly after they are cooked. 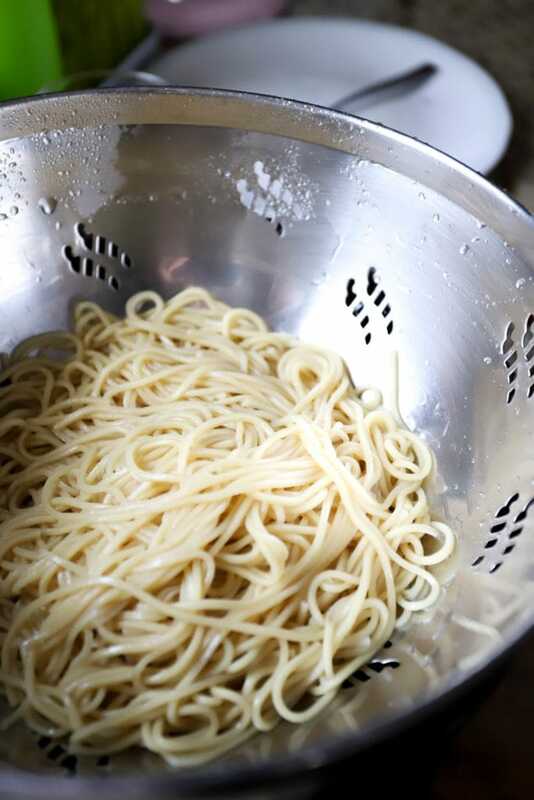 Feel free to substitute any noodle you like or cook the ramen noodles right at the last minute before serving. This salad is great warm and at room temperature.